Ecole Thématique (CNRS) en Biophysique Structurale, à Bordeaux, du 21 au 26 Oct. 2018. The next Symposium on Foldamers will take place in September, 26-28 at IECB, Pessac (click here to get the localization and transport information). 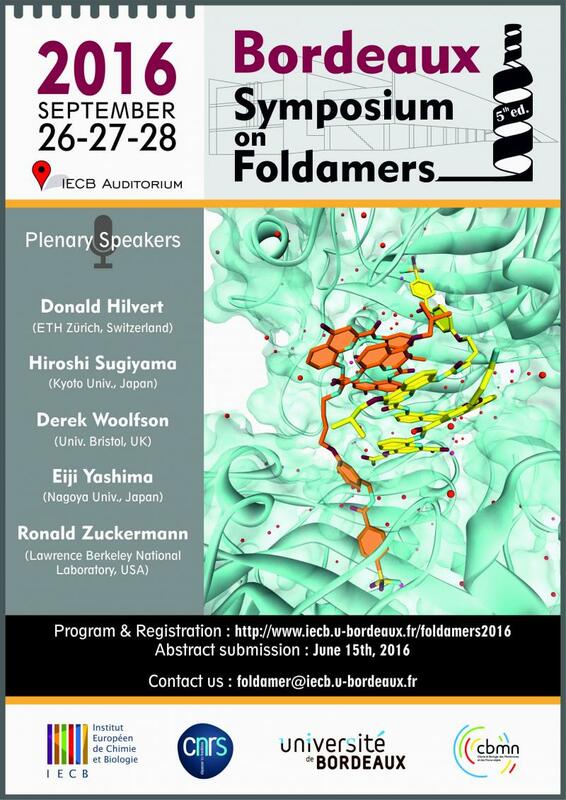 This event, organized by several members of CBMN, will illustrate the multidisciplinary aspects of the field, ranging from synthetic oligomers to folded polymers and to protein and nucleic acid design. A limited number of slots for short lectures are available and will be attributed upon abstract submission. Attendance won't exceed 120 participants and early registration is strongly recommended. Early hotel booking is also advised. Abstract submission: May 15 or when the symposium is full.